Meet Bryan and Sara Nass. 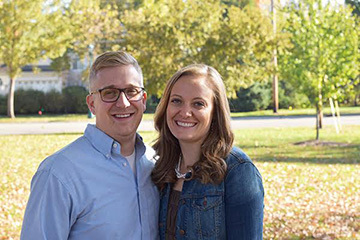 Bryan Nass and his wife, Sara, currently reside in Columbus, OH, where Bryan has served as the pastor of student ministry and small groups at Vertical Church Columbus for 4 ½ years. Bryan put his faith in Christ as a middle school student, and he largely credits his Godly parents and faithful teaching in youth group as the way the Lord reached him. After God changed Bryan’s focus and career goals from pursuing a business degree, Bryan attended Moody Bible Institute and graduated in 2012 with a B.A. in Youth Ministry. It was also at Moody that Bryan met, and married, Sara, who graduated in 2011 with a B.A. in Women’s Ministry. Bryan has had the opportunity to work with student ministries in a variety of environments, from the inner city of Chicago during his years at Moody, to a more rural setting during a summer internship in Robins, Iowa, and now in the urban and suburban environment of Columbus, OH. In every situation Bryan’s passion is to see students become passionate, unashamed, and devoted to Christ while learning to care for each other. Bryan has a deep desire to see today’s students become tomorrow’s leaders in the church.